Hunting is a popular pastime across the US. It’s enjoyable, skilled, and practical, enabling you to enjoy the outdoors while getting food for your family. However, while hunting is a sport enjoyed by millions of adults, many families are reluctant to bring their children along. Provided you follow the necessary safety precautions, hunting can be a safe and enriching activity for children. Here are the top reasons you should bring your children hunting. Hunting teaches kids about nature, while getting them active outside. The biggest complaint among parents these days is that children spend too much time indoors and in front of the TV. Hunting is a great family activity that gets the kids in nature, while doing something constructive with their time. Hunting teaches responsibility and independence. Many kids grow up with few responsibilities and little understanding of the work it takes to provide for a family. Hunting puts into perspective the work involved in earning food in a way that’s easier to comprehend for young children than the concept of currency and employment. Hunting requires focus and discipline. Do you ever feel like your kids just can’t calm down? Are they bouncing off the walls, unable to channel their energy toward productive activities? Hunting is a sport that teaches patience, focus, and discipline. Children learn quickly that goofing around is dangerous when hunting. With enough practice, children will learn to patiently and quietly seek out targets, which is a skill that can be transferred to many other facets of their life. There are few things more enriching than piling the family into the pickup and tearing off into the woods for a day of hunting. Hunting is a great family activity, and it offers the potential for bonding in a deeper way. The teachable moments are many, from educating your children about gun safety to demonstrating how to prepare meat from a carcass. Where else will your children learn to hunt? While hunting is popular in many places throughout the US, it nonetheless faces fierce opposition as well. If you want your children to grow up to be hunters, it’s imperative to get them started early. That way, they’ll already be seasoned and avid hunters by the time they grow up, and the anti-hunting fanatics won’t be able to sway them. What Age Can Children Start Hunting? Sure, hunting with kids is great and all, but how young is too young? State laws regulate the age in which your child can hunt, with 10 years being common for small game and 12 years for larger game. Check your state guidelines for more information. The important thing to remember is your child needs to be mentally and physically prepared before accompanying you on hunting trips. Here are some key safety precautions to keep in mind. Educate your kids about gun safety before taking them out. Ensure kids are wearing the proper ear and eye protection. This is vital, especially as a child’s eardrums are more sensitive than an adults. Ensure children stay by your side the entire time. Ensure your kids are wearing fluorescent hunting gear. This way, in the event they do wander off, you’ll be able to find them quickly. If you’re hunting near water, ensure your children are competent swimmers before bringing them along. More hunters die of drowning each year than from guns, so water safety is crucial. Hunting is a fun family activity that offers a number of educational benefits to children. Still, it can be dangerous, and it’s important to educate your children about gun safety before taking them out. 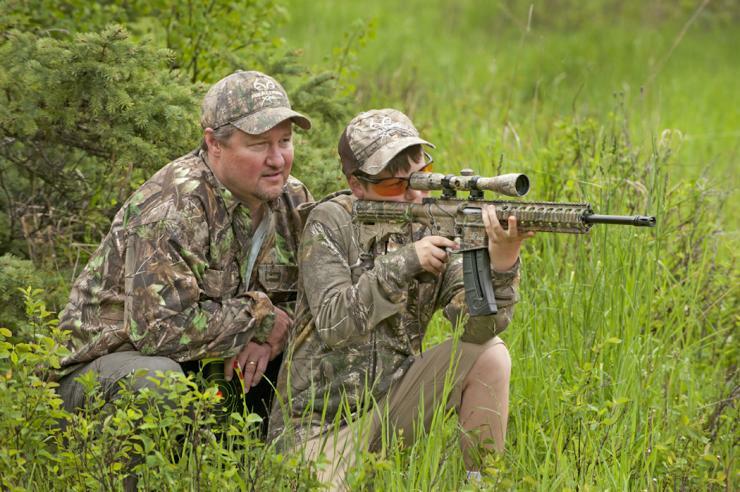 Hunting age laws vary by state, so check out the laws in your state before passing the rifle off to your kid.